Sara is a natural jumper with lots of scope , she always try’s her hardest in every aspect of riding. Sara has 3 lovely paces walk, trot and canter with an outline in walk and trot. Sara hacks out alone or in company not phased in the slightest of heavy traffic. 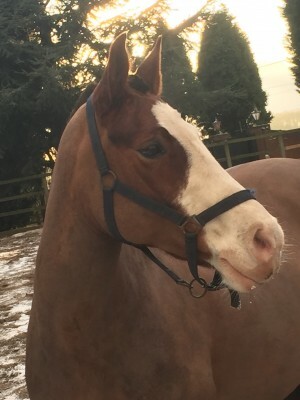 She is a typical mare with an attitude and has a great character. Sara has competed in Working Hunter and Showjumping she is always in the ribbons. Has competed up to 90cm but could achieve more with consistent work and more confidence. Sara has been out and done it all. She is a hunting machine and she will jump anything you throw her at including cross country. Sara comes with all her tack rugs etc and full competition wardrobe.